That's issue Number 1. By the appearance of this issue Victory did indeed crown the American Expeditionary Forces and the Bell Telephone News was filled with news of returns from "Over There." While the A.E.F. officially was established July 5, 1917, and last week's "Storytelling + Research" showed the first 33 of the "Hello Girls" arriving in Paris in March of 1918, the Timeline of World War I shows how quickly their entry made a difference. While their motto of "War to end all wars" wasn't fulfilled, World War I was certainly stalemated until the A.E.F. arrived. General Pershing kept them separate and refused to let the U.S. simply fill gaps in the allied armies. As a result the cry of "La guerre est finie!" ("The war is over!") erupted on the 11th hour of the 11th day of the 11th month of 1918. Oleda Joure Christides, whom I portray in telling about the "Hello Girls", was in the final unit sent to France. She was barely 20 years old and so she was among the few, 50, still alive when in 1977 Congress recognized their service as true members of the U.S. Army. There were even fewer by the time the army sent the official recognition of an honorable discharge and long overdue Victory Medal. Those who died before receiving it were not given even that. Here's what appeared in the next issue of Bell Telephone News about Oleda and her friend and supervisor, Louise Gordon. They were close enough that when a fellow operator had to accompany Oleda on leave visiting her brother, Wallace, Louise was chosen. It also mentions returning with another Michigander and head of the Signal Corps, Major General George Owen Squier. 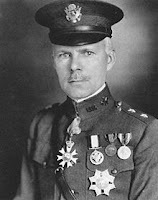 His engineering and inventions included multiplexing, which he invented in 1910 and gave American communications an advantage over the Germans lacking it. One "Hello Girl" who did not return, Cora Bartlett, was the subject of an earlier article here on July 11, 2015. I strongly recommend clicking that hotlink. Because the photos there were removed (I believe by the Hillsdale Historical Society, to whom I gave information about her) this photo combines two segments of "In the Camera's Eye" that formed the center of each issue. Cora's portrait spanned both pages and doesn't align completely. Hillsdale County area provided three operators, Ms. Gordon from Litchfield, who worked in Detroit, Cora Bartlett, and Norma Finch, who fell in love with and soon married Captain Ellis Joel Carman shortly after her return. Later in that same issue on page 11 it's interesting to read of the need for new employees. Prowling old issues of Bell Telephone News isn't always easy. Information sometimes appears in small bits of chatter with little chronological timing. On page 6 of Volume 9, Number 5, (December 1919) this comment was placed under the Jackson District. "Hillsdale is not Paris, but Miss Norma Z. Finch and Miss Elizabeth Shovar are quite content at the former exchange and have no desire to return to the French metropolis. "When the call came from the Signal Corps for operators, Miss Finch of Hillsdale and Miss Shovar of Detroit responded. They became 'buddies' in France. They were 'buddies' through the grueling days of the last advance on Paris when they knew that in case of evacuation, the Signal Corps would be among the last to leave. During the long months after the armistice the exchanges were still operated in Paris. Thousands had returned home and the operators wanted to go home, but they stayed until the A. E. F. was sufficiently demobilized to discontinue the service. "Miss Finch and Miss Shovar are glad to be home. They appreciate everything about the town as nobody can who has not had their experience." Here's an earlier article from the previous month in November 1919 about the return of Ms. Finch and Ms Shovar with two other Detroit operators. 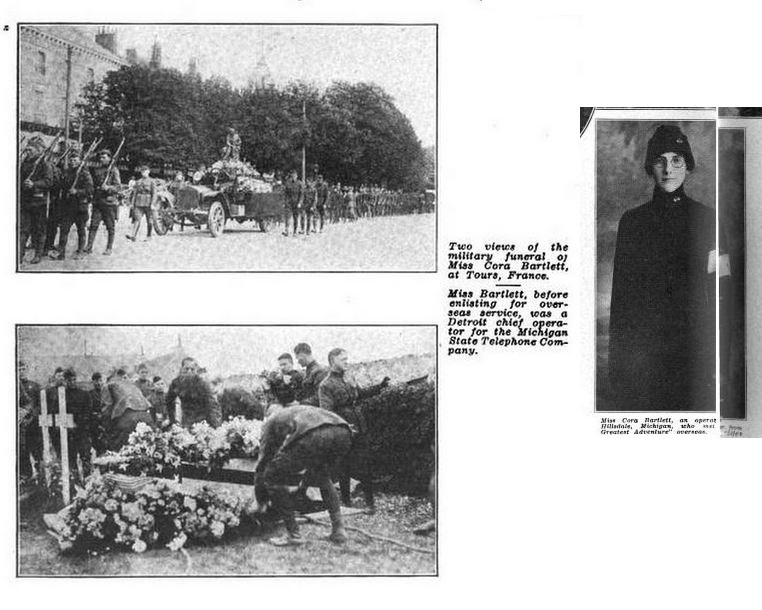 Those same operators and Ms. Gordon joined with Oleda Joure to meet in a stateside memorial service for Cora Bartlett after her burial was in France. These articles were part of the return to the United States, but the war had changed the world and more would be needed than just "Girls -- a lot of 'em."